Ever since I was a kid I have dreamed of travelling to strange new worlds and through VR and the game iOMoon I finally got the chance to do this. 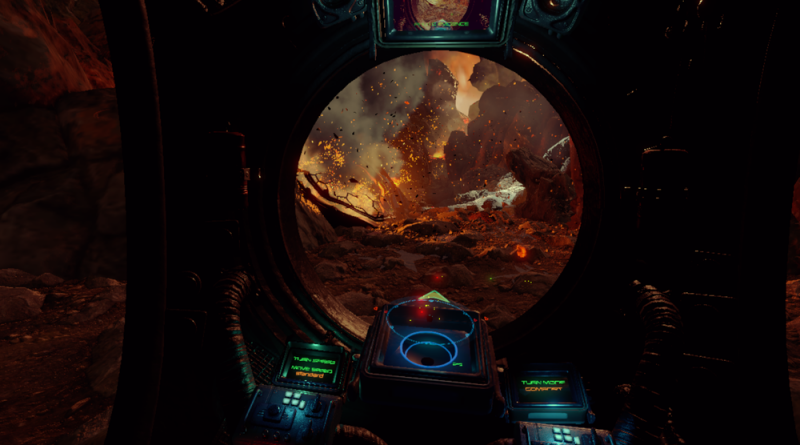 From the moment you enter the games menu which sets the player below a giant space station spinning overhead and asteroids tumbling and colliding all around you just know this is going to be one hell of a trip! iOmoon is the brainchild of developer Drew Medina, CEO of HeadTrip Games. Drew is no stranger to the gaming industry with a career stretching back all the way to the Atari days. He has worked on several teams and has helped to bring us some awesome titles over the years such as Gauntlet Legends, Jet Moto 3, Enter the Matrix, and most recently GTA V. With all of this experience and passion, he has now set out on his own to create one of the most breathtaking pieces of digital art I have seen yet in VR. It is incredible when you realize that this game was done by just one developer working in Unity. As described on the HeadTrip Games web page, iOmoon is an amazing and immersive, made for VR experience where you pilot an exploration probe into the heart of Jupiter’s moon iO. Explore and survive while gathering evidence of possible life on another world. Streaming technology allows for a non-stop adventure into a world filled with “things” to discover as 3D audio fills the world around you! After playing the game, I would have to say this is a spot on accurate description of the experience. I can honestly say that this game captures the essence of what I dreamed VR would be like! The visuals and audio engineering are some of the best I have experienced yet in the Oculus Rift CV1. iOmoon delivers on so many levels with its eye candy being one of the titles greatest strengths. This game is all about exploration and discovery and as such has great pacing for a VR title. There are lots of hidden areas to find and new life to discover. iOmoon is currently available on Steam early access for $19.99 and can be played on the Oculus Rift CV1 and DK2. Vive support is also planned and will be coming to the game soon. Head over to the link provided and grab a copy of this incredible VR experience for yourself. You will not be disappointed that you did!